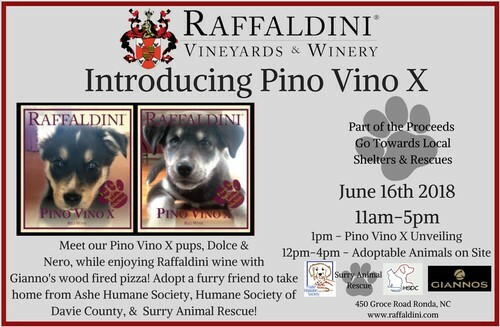 Ronda, N.C., (June 14, 2018)—Saturday, June 16th, Raffaldini Vineyards will release and Pino Vino X, a limited-edition red wine featuring the Raffaldini family rescue dogs with proceeds benefitting local animal shelters. 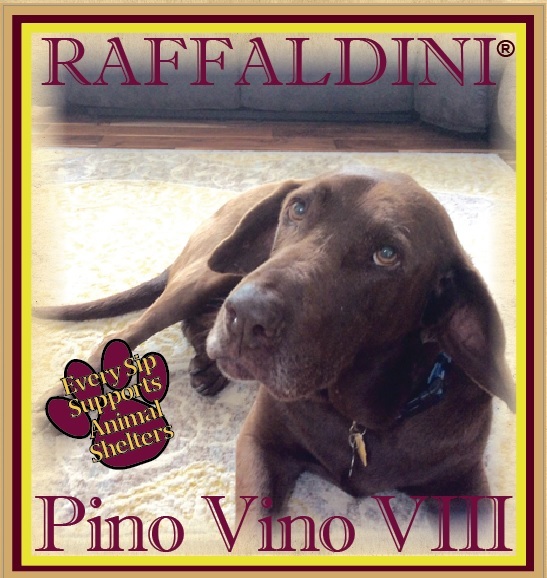 For the last decade, Raffaldini Vineyards has supported local animal rescue organizations by donating proceeds from the sale of each Pino Vino wine release. The first label featured Pino, who Jay and Maureen Raffaldini rescued from a kill shelter when she was 1 ½ years old. 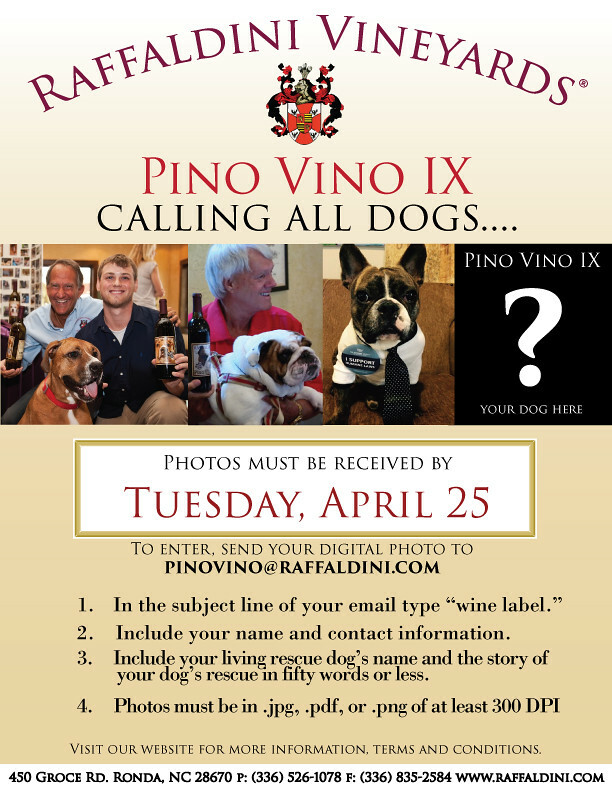 On this 10th year, Raffaldini will unveil the labels of Pino Vino X that will feature puppy photos of the newest members of the Raffaldini family, Dolce and Nero. Pino Vino X sells for $20 per bottle. On Saturday, guests can meet the Raffaldini family, rescue dogs Dolce and Nero, as well as taste and purchase bottles of Pino Vino X while supplies last. Raffaldini Vineyards will also honor Dr. Ruth Gillis, Vet and Owner of Forsyth Veterinary Hospital, who has been immersed in the Triad animal welfare and rescue community for more than 17 years. Adoptable pets from Ashe Humane Society, Surry Animal Rescue and the Humane Society of Davie County will be in attendance. Dr. Gillis earned her Doctor of Veterinary Medicine and Animal Science degree from Tuskegee University. In 1985, she began practicing small animal medicine in upstate New York and moved to Winston-Salem, N.C. in 2001. Dr. Gillis purchased Forsyth Veterinary Hospital in 2005. 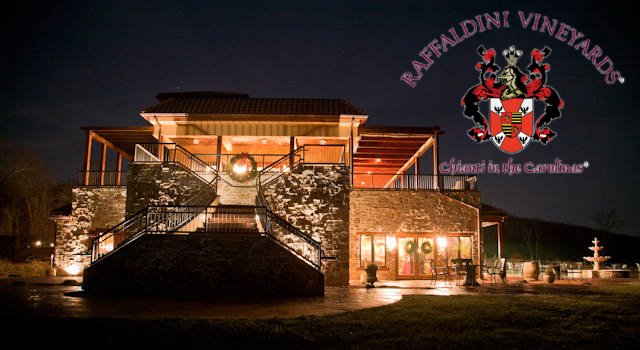 Raffaldini Vineyards is a family-owned winery and vineyard nestled in the Yadkin Valley Region of North Carolina. 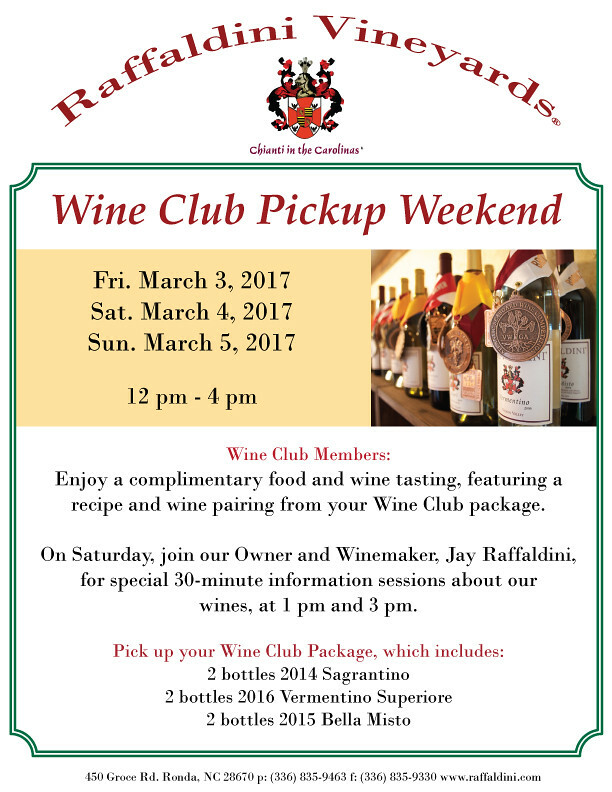 They specialize in Italian-style blends and varietals which have earned them the reputation of ‘Chianti in the Carolinas.’ For more information, please visit their website at www.raffaldini.com, or contact their tasting room at 336.835.9463. This Saturday, Pino Vino X Release! Please join us on June 16, 2018 from 12pm-3pm for a fun filled family afternoon when we release Pino Vino X. 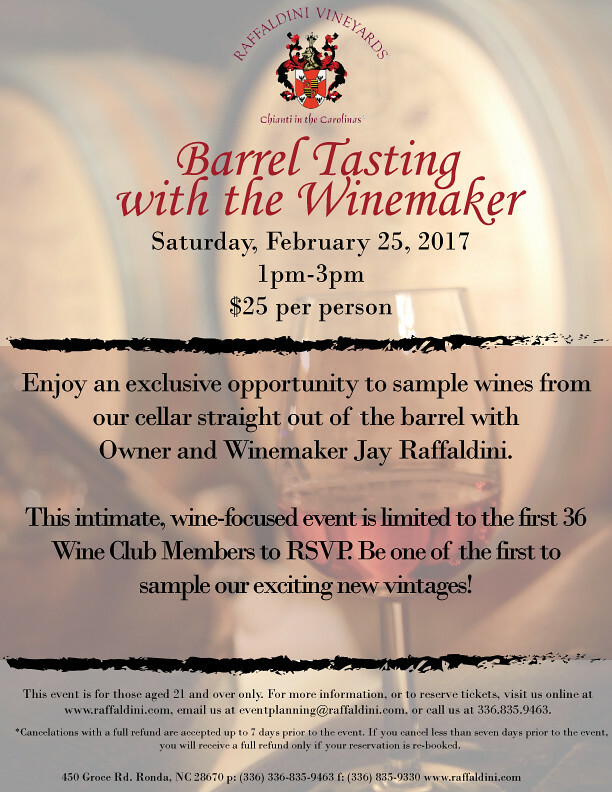 Join owners Jay Raffaldini, his wife, Maureen, and his sister, Barbara and show your support for the furry friends in your life by attending this special release from 12pm-3pm. At 1pm, Raffaldini Vineyard will honor the work of Dr. Ruth Gillis of Forsyth Veterinary Hospital for her many years of volunteerism in the animal rescue community, and unveil the new Pino Vino X and ambassadors, Dolce and Nero. 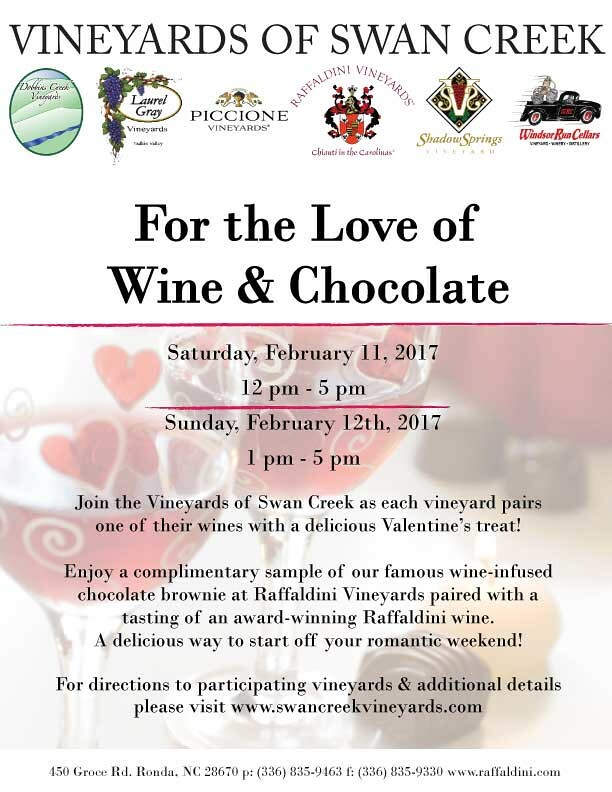 Gianno's Brick oven pizza will be on site serving up your favorite pizza pies to pair with Raffaldini wine. You can even pet, love, and adopt your very own rescue animal from Ashe Humane Society, Humane Society of Davie County, and Surry Animal Rescue who will bring a furry friends to Raffaldini! For the last decade Raffaldini Vineyards has officially supported local animal rescue organizations by donating proceeds from the sale of each of its Pino Vino wine releases. The first label featured Pinot, who Jay and Maureen Raffaldini rescued from a kill shelter when she was 1 ½ years old. On this 10th year we are pleased to unveil the labels of Pino Vino X that will feature puppy photos of the newest members of the Raffaldini family, Dolce and Nero. 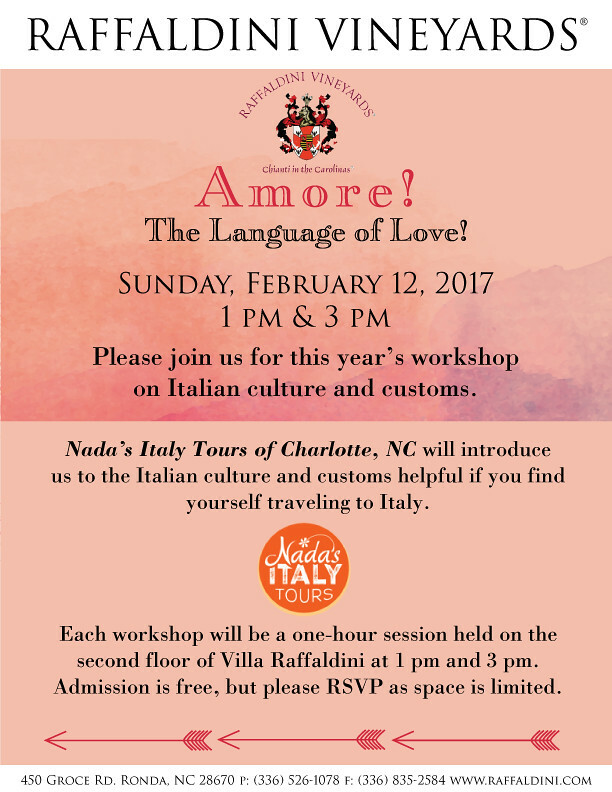 Stop by the tasting room, visit our website, call 336.526.1078 or email us for more information or to make a reservation. Looking for the perfect venue for your upcoming event? 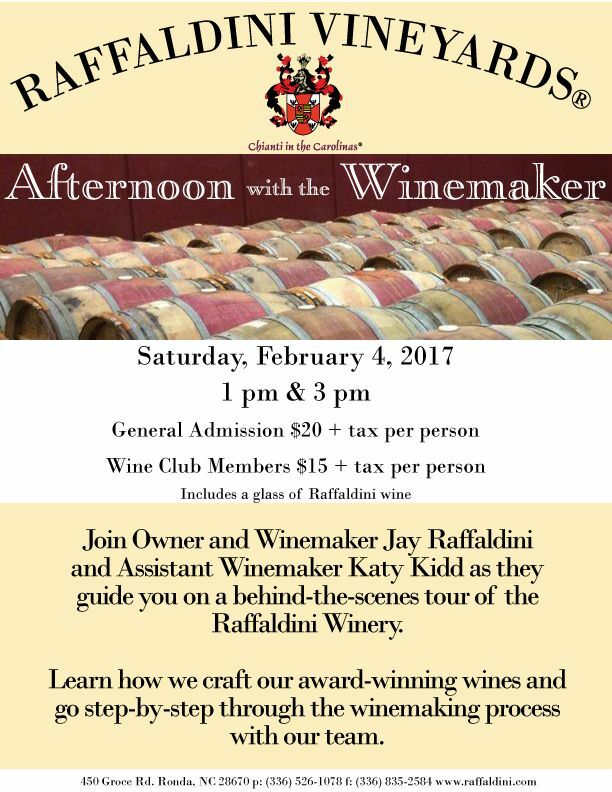 Raffaldini Vineyards is currently booking for the 2018 season.